The market of automobiles is changing. Modern cars use more electronics than ever and adoption of electronic components in general and processors in particular is not going to slow down. All major automakers are working on self-driving vehicles, which means that cars of the future will need even more sophisticated SoCs. As demand for components needed for autonomous cars is about to explode in the coming years, it is not surprising that more companies start to develop solutions specifically designed for such vehicles. Arm on Wednesday launched its new Arm Safety Ready Program that is aimed to develop solutions for self-driving cars. In addition, the company launched its Cortex-A76AE, its first processor IP designed specifically for autonomous vehicles. Arm is clearly not a newcomer to the automotive market. The company’s general-purpose and real-time cores have been used by makers of various vehicles since 1996. Nowadays Arm’s IP is used for ADAS (collision avoidance, cruise control, etc. ), connectivity, infotainment, powertrain control, and other components of the cars. Meanwhile, up until lately Arm supplied automakers its IP originally developed for various devices in general. By contrast, the Arm Safety Ready Program is a multi-year program under which the company will develop Automotive Enhanced (AE) custom and semi-custom solutions for autonomous cars. 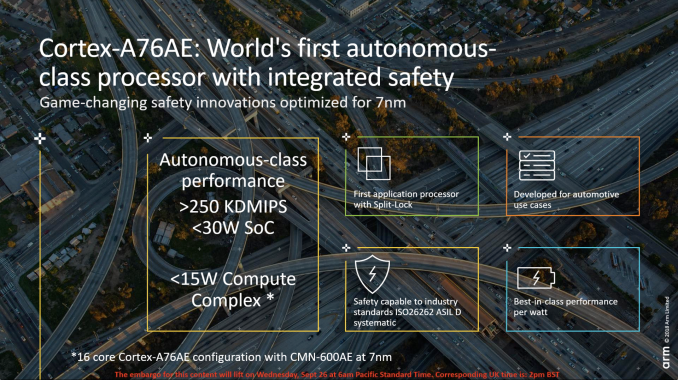 Initially, Arm will start with solutions for Level 3 self-driving vehicles, but over time it will offer products built for Level 4 and Level 5 autonomous cars sometimes in 2020 and beyond. 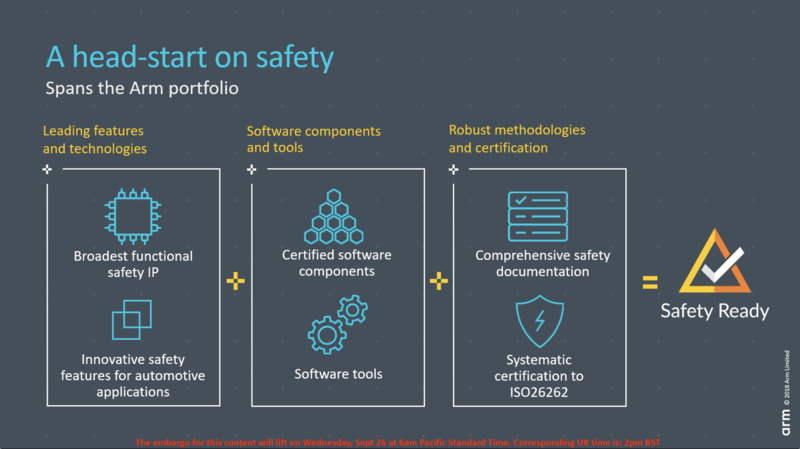 The Arm Safety Ready Program spans the company’s entire portfolio of products and will include certified physical IP blocks to be made using specific process technologies, ISO 26262-certified software tools and components, safety documentation, and so on. Right now, Arm only talks about its Cortex-A76AE processor for self-driving cars, but the grand plan includes Automotive Enhanced processors based on the Helios and the Hercules microarchitectures. 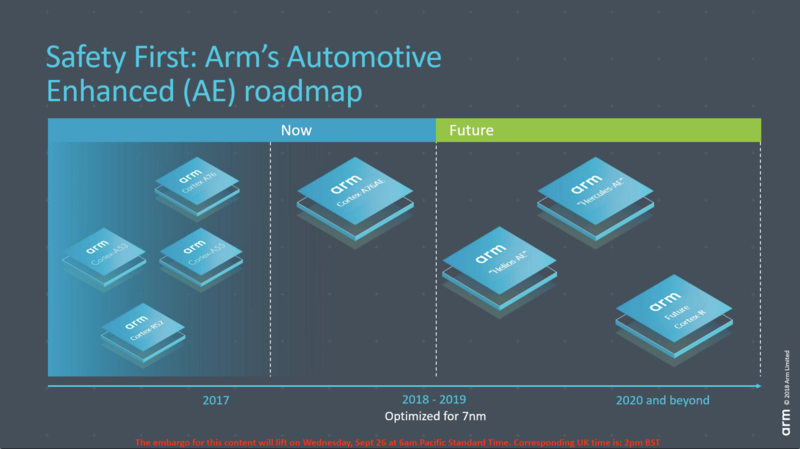 Besides, Arm intends to offer AE versions of its future Cortex-R cores sometimes in 2020 and beyond. 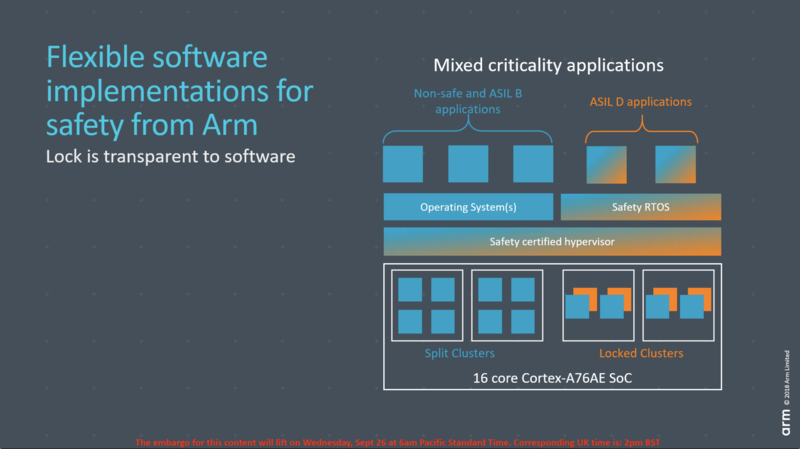 While Arm is developing AE flavors of its future IP, it will keep offering its existing cores (e.g., Cortex-A72, Cortex-R5, Cortex-R52, Cortex A53, Cortex-M4, Cortex-M7, Cortex-M44, etc.) to developers of SoCs for automotive market. The implementation of the ASRP will enable makers of cars to obtain IP that will make their systems for autonomous driving significantly more energy efficient and cheaper, which will make self-driving vehicles more affordable in general. 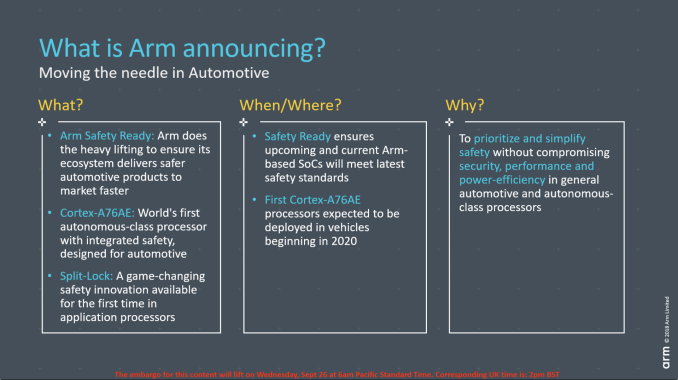 Besides making the said systems cheaper, Arm Safety Ready Program also promises to speed up their development. The first product that is a part of Arm’s Safety Initiative is the company’s Cortex-A76AE processor with integrated redundancy. As the model number suggests, a Cortex-A76AE compute complex relies on up to 16 Cortex-A76 cores that support all the RAS (reliability, availability, serviceability) capabilities featured by the Arm v8.2 microarchitecture, and work in work in Split-Lock mode to ensure reliability. Actual SoCs based on the Cortex-A76AE can scale to up to 64 cores. 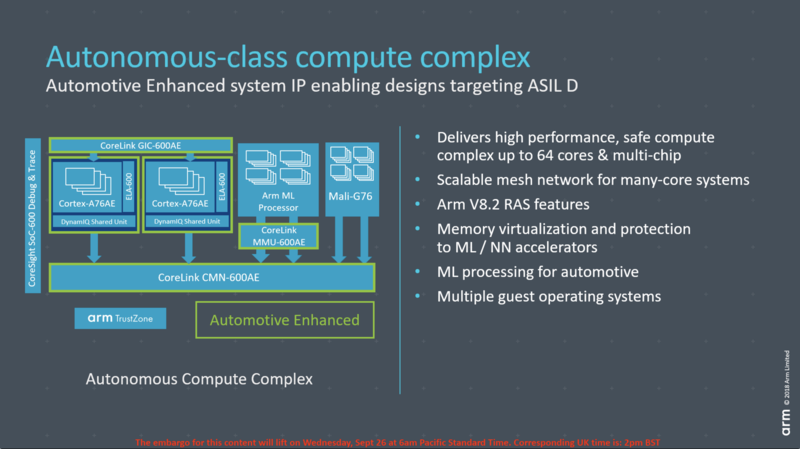 Besides general-purpose compute cores, Arm’s autonomous-class compute complexes also integrate Mali-G76 graphics cores, ARM’s ML cores, and other necessary IP. Besides, the complexes are set to support Arm’s memory virtualization and protection technologies required for flawless operation of ML and NN accelerators. According to Arm, a 30-Watt 16-core Cortex-A76AE SoC implementation made using TSMC’s 7nm process technology has performance of over 250 KDMIPS, which is enough for today’s applications. If a customer wants a higher performance, it may build into more cores, or even use more than one SoC. Raw performance is what actually matters for self-driving vehicles. Modern Level 3 autonomous cars run multiple programs at once and that is not going to change anytime soon. 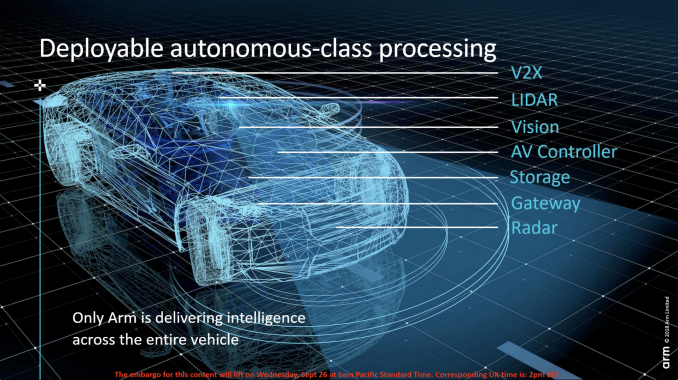 According to Arm, software for a Level 5 self-driving auto will contain 1 billion lines of code. By contrast, software used to run a Boeing 787 Dreamliner contains 14 million lines of code. 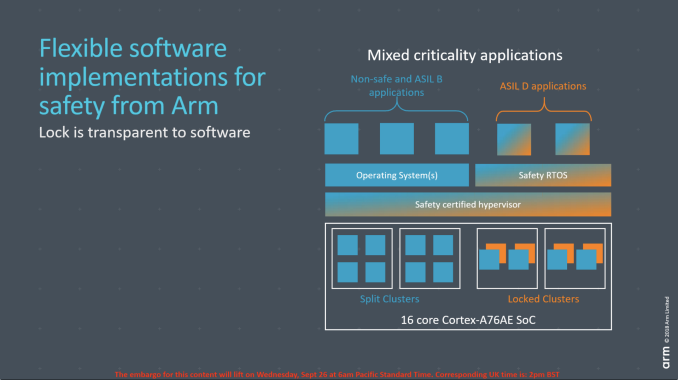 Now, time to talk about the key feature of Arm’s Cortex-A76AE — the Split-Lock technology. The Split-Lock feature enables SoC developers to use the cores in two modes: the Split Mode to runs the cores independently and achieves higher performance, and in the Lock Mode a core is run in lockstep with a paired core, running the same code and monitoring for any kind of divergences that would be then reported as an error, and failure recovery mechanisms would take over (or at least a driver will be notified). The Lock Mode somehow resembles how HP’s NonStop works for mission-critical applications, but the key difference is that Arm’s solution relies completely on hardware and is therefore compatible with any software (think AutoWare, Deepscale, Linaro, Linux, QNX, etc.). Arm proposes to use the locked clusters for ASIL-D application that are critically important for safety. By contrast split clusters are intended for ASIL-B apps like infotainment. 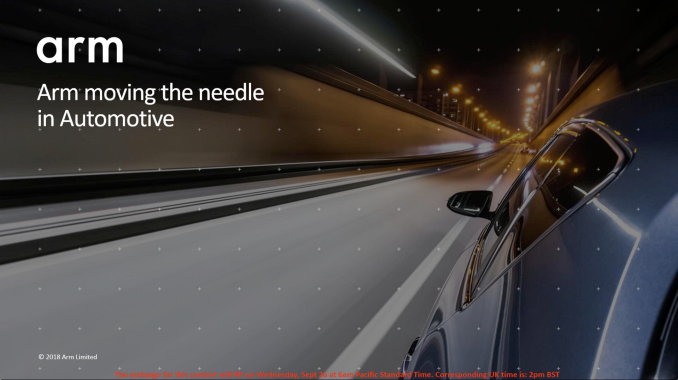 Given the flexibility of Arm’s hardware-only approach, the Split-Lock can be used by any automaker to run almost any software while ensuring either performance and error-free computing. While this is interesting there is a flip side. The next car with this is going to total itself when it gets in a wreck with a legacy vehicle. The cost of all those radar systems and other electronic components is increasing the replacement costs when vehicles get into wrecks or are in natural disasters like a hurricane. Right now there are no cost controls because the price of the equipment is expense and generally custom. Advances are happening as manufacturers are starting to standardize and thus economies of scale will take effect. However, real mass production of these systems won't happen until the automotive gets the technology right. I do see this happening in my lifetime but the hype is out of control with some expecting fully autonomous vehicles in five years. Maturity will be a big thing, especially as insurers will have to account for this. Yeah it is really just you. Do you complain about the chips in the hospital as well? The chips that drive all the money systems? I suspect, that folks like Fergy had a field day back in the late 40ies/early 50ies, mocking all the paranoid, anti-progress types who werent enthusiastic about nuclear bombs and nuclear energy. And nope, it would seem that HStewart isnt the only one to question the wisdom and benefits of self driving vehicles. A law forbidding self driving cars, both in personal vehicles but especially commercial vehicles, would be a great idea. If you're a naive, white&middle class techno-utopianist in North America, selfdriving vehicles seem like "the future". But in reality, they will cause more problems than they solve.